The location managers responsible for the settings of the films “Dunkirk” and “Baby Driver” and the television shows “Game of Thrones” and “Ozark” won the top awards on Saturday night from the Location Managers Guild International, which presented its fifth annual awards at the Alex Theatre in Glendale. Ben Piltz and Arnaud Kaiser won the Outstanding Locations in a Period Film award for the Christopher Nolan film “Dunkirk,” sections of which were filmed on the actual beach where the World War II evacuation took place. Doug Dresser and Kyle Hinshaw won in the Outstanding Locations in a Contemporary Film category for “Baby Driver,” which was set in and around Atlanta. In the television categories, the multi-country production “Game of Thrones” and the Missouri-set “Ozark” (which is actually filmed around Atlanta) won the awards for period and contemporary series, respectively. In addition to having a hand in one winning film and one winning television series, the Atlanta Mayor’s Office of Film and Entertainment also won the Outstanding Film Commission award. Honorary awards went to location managers Rino Pace and Josh Karan. The show was hosted by comedian Jonah Ray. 2017 was a strong year for cinema, with achievements that can be measured on many yardsticks: It was the year a Wonder Woman got to rock the seemingly unassailable superhero genre, the year a black sketch comedian became a massively profitable writer-director, and the year when Tiffany Haddish ascended to the comedy cosmos. Corporate filmmaking may continue to choke Hollywood (and a Disney-Fox merger isn't good news in that department), but this was a year when there was always something to recommend, whether it was blasting to the big screen or streaming to a smaller one. 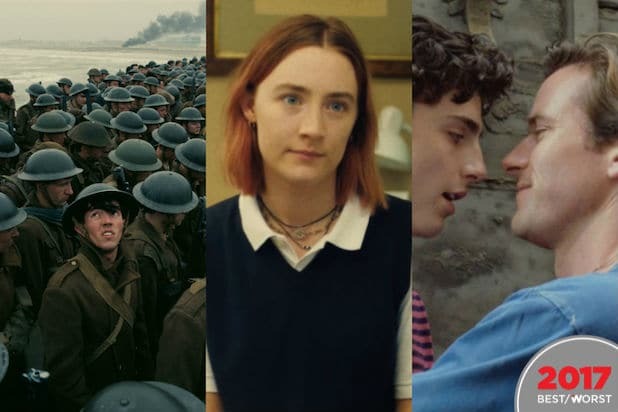 “Beach Rats,” “Blade Runner 2049,” “BPM,” “The Florida Project,” “God’s Own Country,” "Graduation," “I, Tonya,” “Ingrid Goes West,” “The Killing of a Sacred Deer,” “Phantom Thread,” “Professor Marston and the Wonder Women,” "Sieranevada." Currently streaming on Netflix, this import from Georgia features one of the year’s most powerful performances: Ia Shugliasvili stars as Manana, a wife and mother living in an overcrowded Tbilisi apartment with her parents, husband, and adult children. She shocks all of them by moving out and getting her own place in this powerful and often darkly funny character study. Amidst the popcorn fluff of summer, we got two auteurist films that dropped audiences into the middle of historical brutality. Christopher Nolan’s “Dunkirk” was a suspenseful, staccato WWII story presented from a variety of perspectives, while Kathryn Bigelow’s “Detroit” was a hard-to-watch horror-show about police brutality in 1967 that rang all too true in 2017 America. Both films were illuminating, visceral experiences. This very contemporary ghost story -- where are those texts coming from, and how recently were they sent? -- reteamed Kristen Stewart with director Olivier Assayas, who previously guided her through the acclaimed “Clouds of Sils Maria.” Stewart is never less than brilliant as a millennial medium who is as trapped between life and death as she is stuck between career paths. Mike White and Noah Baumbach strengthened their reputations as two of the leading voices of graying white Gen X-ers with these hilarious and heartbreaking character studies of middle-aged men facing regrets, paths not taken, and the angst of sending your kid off to college. Adam Sandler (in “Meyerowitz”) and Ben Stiller (in both movies) are given the opportunity to offer some of their most heartfelt, adult acting. Lois Smith’s heartbreaking performance deserves notice, but there’s a lot more to this poignant and provocative look at the end of life and how we often become the unreliable narrators of our own lives. The extraordinary ensemble also features Jon Hamm, Geena Davis and Tim Robbins, all under the subtle and humane direction of Michael Almereyda (adapting the play by Jordan Harrison). It’s a brilliant horror movie that follows the Blumhouse rules -- maximum scares on as few sets as possible -- but this chiller is so much more. Making his debut as writer-director, Jordan Peele crafts a prickly, hilarious and terrifying metaphor for American life in 2017; what Ira Levin did for feminism with “The Stepford Wives,” Peele does here for #BlackLivesMatter. Of the three Dunkirk movies I saw this year, this one’s my favorite. Unlike so many of the valentines to filmmaking we’ve seen lately, this one cannily sends up its subject -- wartime propaganda movies -- while telling a story that pushes all the same buttons. (It’s as stirring, funny, romantic and poignant as anything turned out by the War Office.) Gemma Arterton shines as a copywriter who gets promoted to the pictures, and Bill Nighy is, as always, a charmingly roguish ham, but it’s Sam Claflin who makes the most of his meatiest role to date, proving he’s more than just a YA crush object. A hauntingly beautiful salute to just about everything that’s come out of the Hollywood dream factory -- from monster movies to silents to musicals -- and the best movie Guillermo del Toro has made since “Pan’s Labyrinth.” Sally Hawkins suffuses her mute character with longing, Richard Jenkins upends gay-best-friend clichés, and the beauty of 1962 design hides men’s ugliest impulses in this breathtaking creature-feature romance. Greta Gerwig has been dazzling art-house audiences for years in vehicles like “Frances Ha” (which she co-wrote) and “Damsels in Distress,” but no one was quite prepared for how lovely or heartfelt her solo debut as writer-director would be. Saoirse Ronan dazzles anew in this smart and unsentimental coming-of-age tale, and Lucas Hedges and Timothée Chalamet provide key support as boys who cross her path, but it’s Laurie Metcalf’s brusquely funny turn as a frazzled mom that allows this stage and TV legend a rare chance to shine at the movies. First love is awkward, and it involves lots of second-guessing and misreading of signals and badly hidden obsession. Movies don’t usually get that part right, but Luca Guadagnino’s 1983-set tale of a teenager and his slightly older crush traverses the terrain of the inexperienced heart with subtlety and sensitivity. James Ivory’s script (from the novel by André Aciman) and the two astonishing lead performances by Timothée Chalamet and Armie Hammer make this a romance to remember. Now be sure to check out Alonso Duralde's picks for the worst movies of 2017.